Pending permit approvals, a 40-megawatt biomass combined-heat-and-power facility proposed for a Dow Corning Corp. manufacturing site in Midland, Mich., should be under construction in the second quarter of this year. A settlement agreement reached between seven opponents of a 100-megawatt biomass power plant in Florida and developer American Renewables will allow construction to procede as scheduled. Construction could start in late spring or early summer. The USDA announced March 14 that it is now accepting applications for three funding programs related to bioenergy production: the Biorefinery Assistance Program, the Repowering Assistance Program and the Bioenergy Program for Advanced Biofuels. The U.K. Department of Energy & Climate Change has released details of its previously announced Renewable Heat Incentive, a tariff program designed to help the country meet its renewable energy targets of 20 percent by 2020. As the result of an unfavorable energy market and low natural gas prices, Adage has effectively canceled development of its biomass power facility in Washington state, after securing its required permits and entering into a feedstock agreement. Following through on its promise made in January, the U.S. EPA has officially released its proposal to defer for three years the Tailoring Rule permitting requirements for carbon dioxide emissions from biogenic sources, including biomass. NRG Energy Inc.'s proposed biomass conversion of its Montville Generating Station in Uncasville, Conn., has all of the necessary permits and is ready to begin construction as soon as it has signed a power purchase agreement. 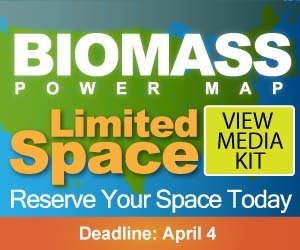 The Biomass Thermal Energy Council held a webinar March 17 to summarize the Maximum Achievable Control Technology rules, discuss studies surrounding emissions from forest and agriculture residues used for energy, and address control technologies. California-based Teichert Aggregates is eyeing its existing Marysville, Calif., site for a new biomass power plant that could consume forest, agricultural and urban wood wastes to produce up to 20 megawatts of electricity. Sherwood Park in central Alberta, Canada, is developing a biomass district heating system, and is armed with a $1.5 million government grant to help with construction costs.The system will use ground wood from pallets and agricultural residues. 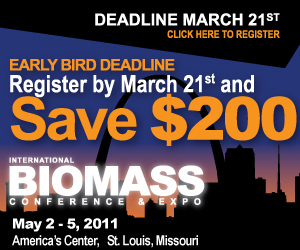 At the International Biomass Conference & Trade Show in St. Louis, May 2-5, Enviva LP CEO John Keppler will draw on his experience serving both European and U.S. woody biomass customer bases.